Summer is almost here, and to celebrate here’s a look at some of the tastiest Aussie barbecue recipes. Many Meriton Apartment Complexes come complete with state-of-the-art BBQ areas, so make the most of it this season and enjoy some al fresco dining in the grounds of your hotel. Combine chutney, peanut butter and soy sauce, and then separate evenly into two small bowls. Thread chicken onto the skewers and, using one of the bowls of sauce, brush the marinade over the chicken. Preheat barbecue, and over a medium heat cook skewers for 3-4 minutes each side. In a small saucepan, heat the coconut cream and the second bowl of marinade for 6-8 minutes. Mixture should appear to reduce and thicken. Drizzle over skewers and serve with an Asian salad mix. Recipe and image from here. Combine lime juice, chilli, garlic and olive oil in a bowl and stir until combined. Add the prawns to the bowl, and coat the prawns evenly with the sauce. Cover the mix and refrigerate for 30 to 60 minutes. Once the prawns have marinated, thread onto the skewers and grill skewers for 2 minutes each side or until prawns are cooked through. Serve skewers with aioli or mayonnaise. Recipe and image sourced from here. Combine garlic, oil, parsley and lemon in a bowl. Add cubed lamb, and toss to coat. Refrigerate mix for 20 to 30 minutes. Preheat barbecue to a medium heat. Thread marinated meat mixture onto skewers with onion and capsicum in the following order: onion, meat, capsicum, meat, onion etc. Cook skewers for 3 minutes each side, or to your liking. Serve with tzatziki and herbed ride. Cut the top and bottom off the pineapple. Remove skin by slicing vertically. Cut pineapple into quarters (slicing lengthways). Once the core is removed, halve each quarter. Thread pineapple onto skewers lengthways. To make coconut yoghurt, place the yoghurt, brown sugar and coconut essence into a bowl. Combine and refrigerate. Combine the sugar and mint into a bowl, and then sprinkle over pineapple skewers. Grill pineapple for 2 to 3 minutes per side, or until caramelised. Make a paste with the lemon myrtle, rosemary, garlic, and a tbsp of the macadamia oil using a mortar and pestle. Stir in thyme, and add to a bowl with kangaroo fillets. Turn to coat, cover, then place in fridge overnight. The next day, preheat BBQ to a high heat and cook kangaroo for 2-3 minutes each side. Leave the meat to rest while you prepare the salad. To make dressing, combine mustard, vinegar and remaining oil. In a bowl, toss salad ingredients and drizzle with dressing. Thinly slice the rested meat, and add to salad just before serving. Preheat barbecue to a medium-high heat. Rub the clove of garlic over each vegetable piece. Cook each vegetable piece on the grill until lightly charred. 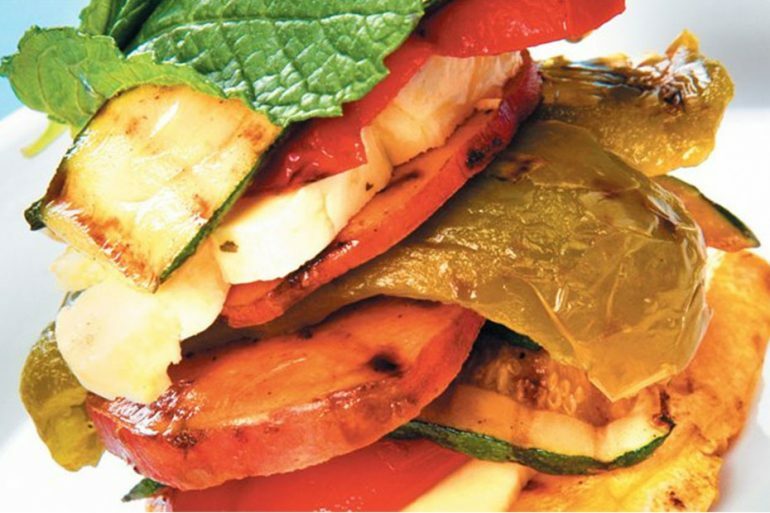 Once vegetables are charred, stack the vegetables onto each other, alternating a piece of haloumi for every fourth layer. For example: sweet potato, capsicum, zucchini, haloumi, eggplant, capsicum, sweet potato, haloumi, zucchini, capsicum, eggplant, haloumi etc. Repeat until you have at least two layers of each vegetable. Bake in the oven on a medium heat until cheese has softened. Add chipolatas to a saucepan of cold water, and bring to the boil over a high heat. Once water is boiling, remove saucepan from the heat and allow chipolatas to stand in the water for 10 minutes. Drain the water from the saucepan. Preheat barbecue to a high heat. Halve bacon lengthways, and then halve the pieces horizontally. Wrap each chipolata in a slice of bacon. Secure bacon wrapping with a toothpick. Cook chipolatas on barbecue for 2 to 3 minutes per side, or until golden. Remove toothpicks, and serve with tomato chutney. Toss salmon in kecap manis, tbsp lime juice and ginger to marinate. Set aside a refridgerate for at least one hour. Remove and bring to room temperature. In a small bowl, combine fish sauce, sugar, oil and remaining lime juice. In a separate bowl, combine cucumber, avocado, spring onion and coriander. Preheat BBQ and remove salmon from marinade. Cook salmon on high heat for 4-5 minutes, turning once and refreshing with marinade. Let salmon rest while drizzling salad with dressing. Grill lime wedges, then serve. Pour lemon juice into a bowl. Whisk olive oil in slowly. Add paprika, salt, garlic and white pepper, and whisk until combined. The lobster tails should be split in half lengthways, and coat the flesh of the lobster with the marinade. Cook lobster tails with the flesh-side down for 5 to 6 minutes. Then turn the tails over and re-coat the flesh with the marinade. Remove lobster from barbecue once cooked (firm to touch and opaque in colour).